It doesn’t matter whether you’ve learnt with us before; you can join the gang at any time. All classes are mixed ability, and you'll need to bring your own yoga mat, unless otherwise stated. Drop-in places are only available for some classes; see class details for more information. Are you ready to have your Santa…sorry….I mean asana….. ROCKED?! £15 per place. Please bring your own mat. Are you just a yoga girl, living in a lonely world? Maybe there’s been heartache and pain, and you don’t know if you’ll yoga again? Perhaps you never really cared until you met….yoga? But don’t let the bells end. I already know I will love this. I want to book now. 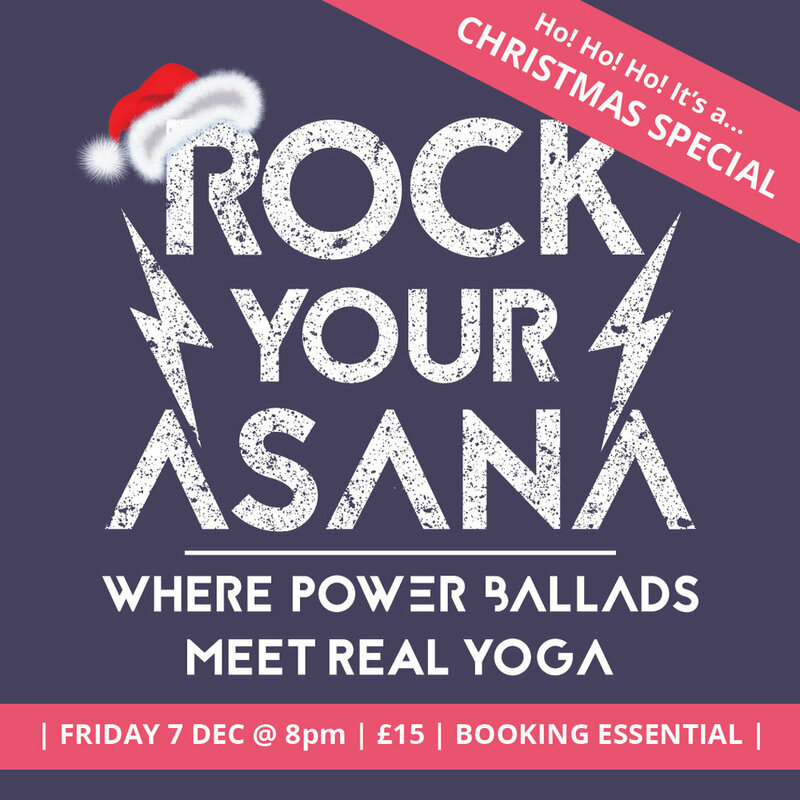 Rock Your Asana brings together two of the greatest things which exist in my world – power ballads and yoga. So this is a 60 minute class in which you’ll move your body through yoga poses, all the while accompanied by a soundtrack of nothing but some of the greatest musical creations of our time. And yes - because it’s that time of the year - there will be the occasional Christmas delight thrown in for a bit of seasonal spiciness. This kind of yoga is for EVERY BODY. In Rock Your Asana it doesn’t matter if you can barely see your toes, let alone touch them. All the poses will be offered with modifications, so it’s perfect for even the most un-bendy of bodies. YES! I wanna take the midnight train to get my asana rocked! I’m still not convinced. How will it work? Then we might start moving through some reclined poses, before getting the blood pumping with Sun Salutations and standing poses. Mr. Mister will help us mend our “Broken Wings”; Jennifer Rush might rouse up the “Power of Love”; whilst Boston remind us that it’s “More than a Feeling”. To end we’ll slow things down. As we find ourselves moving into some deeper breathing Berlin could help “Take My Breath Away”, or The Cars may “Drive” us towards savasana (our final relaxation). Right. So yoga and power ballads go together do they? Are you kidding me? Of course they do! Music has such an incredible power to bring people together and transport them away from their day-to-day life. You only have to look across the crowd at a gig and catch the eye of a complete stranger who is throwing themselves into their own artistic interpretation of your favourite song and in that moment, you are nowhere else but there. It’s a meditation – you are in that moment where the future and past are irrelevant. All is good. All is rocking. You are all connected. And that’s the whole point of yoga – to get us to a place where we recognise we are all connected. To be able to see that same spark of magnificence in everyone we meet (including ourselves) and live a life through which we are always in the present moment, not addled by thoughts of what has been or limited by thoughts of what might be coming. So imagine bringing people together with their love of power ballads, which are already a pretty potent force in their own right, and combining it with an empowering, challenging, but above all FUN yoga practice? We’ll be doing our asana to Aerosmith; busting out a Bakasana to ‘Bon Jovi’ and a Sarvangasana to ‘Starship’. I’ll be throwing in some power-grabbing to Poison, Fierce Pose to ‘Foreigner’, and....um....ok I can’t think of any yoga poses that begin with ‘j’ but there will DEFINITELY be some ‘Journey’. Yes! I wanna go more than half way there; take me to book my place. Yoga Basics for the Totally Un-Bendy: An afternoon workshop.